JNN 26 Oct 2015 SRINAGAR : Despite Restrictions and Deployment of Police & Para Military forces , Shia Mourners Defying all the restrictions and atrocities by the Indian Govt , took out Ashoora Procession from city centre Lal Chowk towards Dal Gate , restrictions were aslo imposed in Civil Lines areas and in few police stations of old Srinagar. Police Tried to disperse the crowd by severe Baton charge and dozens of arrests , but still Shia Men Bravely took out Processions and reached their set routes. However, Muharran processions were taken out across Kashmir valley in which thousands of mourners participated. The biggest Muharram procession was taken from Zadibal and in Mirgund Budgam in which large number of people participated. Police & Para Military forces foiled the Muharram processions at several places by resorting to baton charge and at least 20 mourners injured and detained scores of them. The authorities had promulgated restrictions under 144 CrPC and also imposed strict restrictions in the areas falling under the police stations Shaheed Gunj, Ram Munshi Bagh, Dalgate, Khanyar, Rainawari, Nowhatta, M R Gunj, Safakadal, Lal Bazaar and Maisuma. Mourners had assembled at Shaheed Guj to take out a major procession that would pass from Jehangir Chowk, Moulana Azad Road and culminate at Dalgate. The police swung in to action and resorted to Baton charge towards the mourners and did not allow them to proceed. The mourners showed stiff resistance and were trying to lead the procession. But the heavy deployment of police and CRPF foiled their attempt and arrested scores of them and were lodged in various police stations. The mourners, in small groups, however, managed to reach Jehangir Chowk where they were intercepted by the police again leading to clashes. Police bundled many mourners into the vehicles who were later taken into preventive custody. Police also prevented a group of mourners who were trying to take out a procession from Abi-Guzar. Police swung into action as mourners, including activists of Geelani-led Hurriyat, tried to take out a procession in defiance of prohibitory orders in Lal Chowk area of the city. Restrictions were imposed in several areas of uptown including Maisuma and Abi Guzar areas to disallow the moving of the Muharram procession. Police had also placed barbed wires on many entry points leading to city centre to prevent any major gathering of mourners. However, Muharam processions were taken place across Kashmir valley. A Zuljanah and Tazia procession was taken out in Batakada to Zadibal in Molvi Imran Raza Ansari also participated. Thousands of devotees from Srinagar and adjacent areas participated in the procession. Processions were taken out in Alamgari Bazaar, Balhama, Baarji Harwan, Kral Mohalla Harwan, Gulshanbagh Lal Bazar in Srinagar. In south Kashmir, similar processions were taken out at Wakharwan Awantipora and Panner area of Tral. In north Kashmir’s Baramulla district, processions were taken out in Hanjiveera Pattan, Mirgund, Gund Khwaja Qasim and several other areas. In central Kashmir’s Budgam district, Ashura processions were taken out in Gazi Manzil Imambargah Yousufabad, Magam, Askinderpora Beerwah and Sonpah Beerwah. Anjuman-e-Sharie Shian Chief, Agha Syed Hassan Al Moosvi Al Safvi, took out the biggest Ashura procession from Imambargah Budgam. In Kargil, Ashura was observed under the banner of Anjuman-e-Jamiyat Ullama (Islamia School Kargil). The mourning processions were carried from nearby villages of Kargil town. The processions passed through Main Bazar, Lal Chowk, Khomeni Chowk, Islamia School Chowk, Islamia School and concluded at Qatilgaha-e-Hussaini.). Thousands of mourners participated in these processions. Senior separatist leaders, Syed Ali Geelani, Mirwaiz Umer Farooq, Shabir Shah and Muhammad Nayeem Khan were placed under house arrest. Muhammad Yasin Malik was arrested. Police and Central Reserve Police Force (CRPF) contingents in full-riot gear were enforcing restrictions in the city. In areas placed under restrictions, rolls of razor-fitted concertina wire were erected on street crossings to block passage of traffic and pedestrian movement as the Barbed wires are layed on the Border areas to stop the infiltration of enemy men . The Biased Hindu Government of India , which claims to be secular have imposed every type of restrictions on the freedom of speech , Religion, Movement and Basic Humanitarian issues on the Minorities living in the country . And especially on the Land of Kashmir which was forcefully occupied by the Indian forces in 1948 , and up till now about Six Hundred thousand men of Indian forces are deployed in the Valley of Kashmir to curtail the Independence Movement of Muslim Majority in the Valley , which demands to be annexed with Pakistan , as their elders have voted & decided in the Pre Partition India . 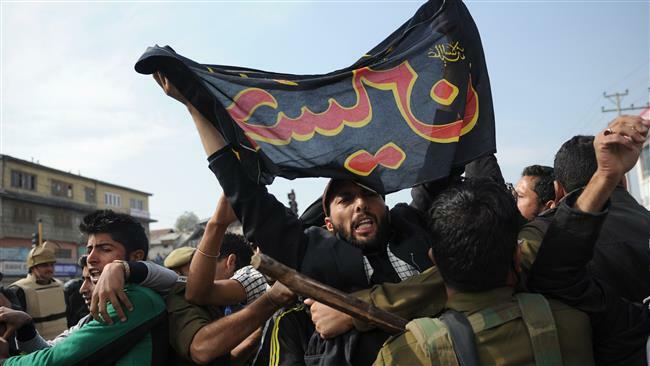 This entry was posted in Asia Pacific, Jafria and tagged Ashoora Procession, India Occupied Kashmir, Muharram, Shia Men. Bookmark the permalink.